« Content: The French Chrysalide trio strikes back with a new album released by Dependent. The sound of Chrysalide always has been rather complex and hard to describe. The band from Strasbourg claims to produce ‘21th Century Industrial Music’. It’s an interesting definition, which for sure reveals one of their most noticeable influences: industrial music! The debut part of “Personal Evolution” directly reveals an impressive production work revealing a powerful and overwhelming sound. The global sound production gives you a real vertiginous impression like the resonating sound in a cathedral! Musically Chrysalide mixes complex electro-industrial arrangements with some kind of bombast. The shadow of Skinny Puppy still traces through the work of this band, but I also have to mention the electro-industrial and distorted style of Dive plus cold sequences reminding me of The Klinik and even a kind of industrial-punkish touch à la Suicide. A few sequences also remind me of early Frontline Assembly, but in the end Chrysalide meticulously assembled all their influences to get a very own industrial-inspired sound. Complexity doesn’t always match with accessibility and that’s probably why Chrysalide will only appeal to lovers of well-crafted and intelligent music. This production is not carried by monotonous verse – chorus patterns, but seems to focus on a kind of anarchistic sound production. The tracks have been composed by a real arsenal of sounds featuring several guitar (samples) like sounds. I can’t say that the first tracks are a bit hesitant, but the 2nd part of “Personal Evolution” definitely reveals the best cuts. “It Gets In the Blood”’ makes things really interesting. This is the kind of song that will appeal to all Skinny Puppy fans. There’s a great twist between all different sound input and a kind of tormenting atmosphere recovering this piece. The track “All demons” is one of the absolute pearls featured on the album. It sounds a bit like The Klinik meeting Skinny Puppy, but mainly symbolizes the high-tech industrial sound dimension of this opus. The last part of the album reveals other essential cuts, which sometimes feature a kind of vintage electro-industrial sound (cf. “Beside The Impossible”). 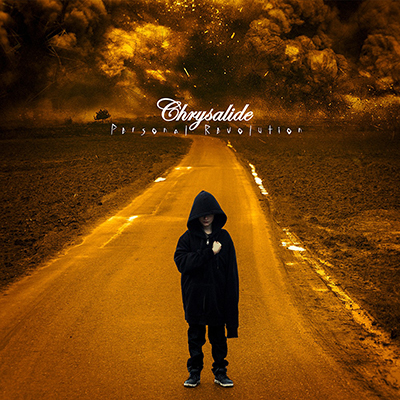 “Substance Over Style” is another noticeable track for its outstanding sound treatments while here again you get the feeling it’s really hard to define Chrysalide’s sound. A last essential item about this work consists of the vocals’ production. There’s a huge diversity in the vocal lines, which sometimes are truly enraged, sometimes half sung – half spoken and sometimes a bit more into a soft approach revealing a delicious French accent. Notice by the way that this album is also available as a DCD featuring a disc with previously unreleased tracks and mainly remixes. Conclusion: “Personal Evolution” reveals a noticeable evolution in sound and global production. This is not the most accessible release, but definitely one I highly recommend for industrial lovers in search of something different. This album sounds pretty visionary! Best songs: “All Demons”, “It Gets In The Blood”, “Substance Over Style”, “Keep Calm”, “Beside The Impossible”.